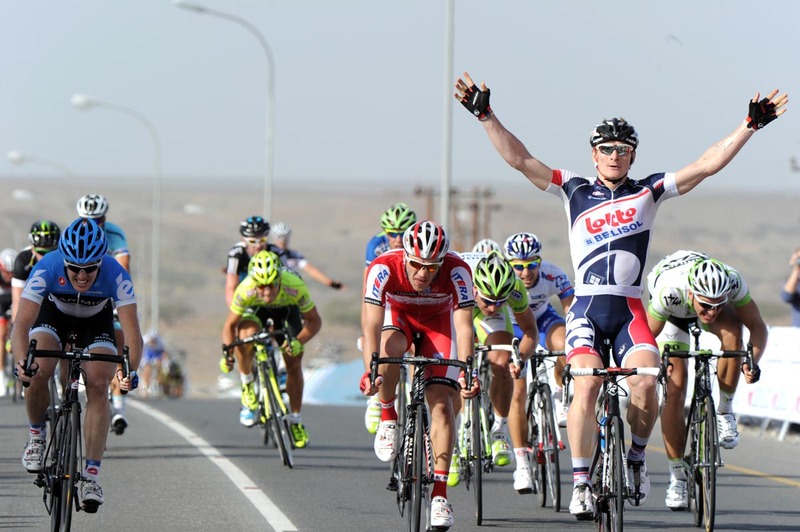 German Andre Greipel (Lotto-Belisol) continued his solid start to the season, taking the opening stage of the 2012 Tour of Oman on Tuesday. Greipel burst through the bunch to put Denis Galimzyanov (Katusha) in second and Tyler Farrar (Garmin-Barracuda) in third. Meanwhile, British sprint star and world champion Mark Cavendish (Sky) did not contest the bunch gallop after getting caught up with an incident with a kilometre to go. Katusha rider Alexander Kristoff (Katusha) took Cavendish off the road, forcing him to unclip and lose position. Greipel won three stages of WorldTour opener, the Tour Down Under in January. Greipel’s elation and key leadoutman Greg Henderson’s shout of “we’re back!” at the finish showed how much it meant to them. There is a strong energy and camaraderie about the Lotto leadout, a combination of Greipel’s former HTC teammates and young Belgians. “Last year, we were just three guys, so it was really impossible to form leadout trains,” Greipel said. Though there may have been an edge to Cavendish and Greipel’s relationship in the past, the German spoke of his respect for the Team Sky rider today.